Since Xamarin released the renamed MonoDevelop 4 as Xamarin Studio I’ve been using it alongside Unity 3D for all my development. It’s definitively better than the Unity-bundled version of MonoDevelop (2.8 with Unity’s patches) for C# development on a Mac. I think I’ve found my new favorite IDE – a title that MonoDevelop has previously never quite taken. There’s still a few rough edges though. The ones I care about most are Unity related. The Unity debugging plugins are missing, but I can live with that for a while. 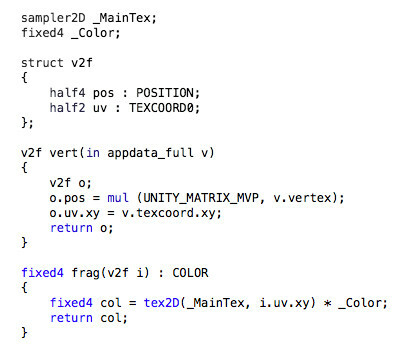 Unfortunately syntax coloring isn’t enabled for shader files, at least those with .shader and .cginc extensions. It’s amazing how hard code becomes to write when syntax coloring isn’t present! This entry was posted in Development and tagged c#, monodevelop, unity3d by joolsa. Bookmark the permalink. Well the source is available here: https://github.com/Unity-Technologies/MonoDevelop.Debugger.Soft.Unity. Whether that’s just going to work against the latest MonoDevelop code I couldn’t say. It’s certainly harder than the syntax coloring 🙂 I hope Unity will end up shipping a version of the MonoDevelop close enough to mainline that we can simply compile their plugins in future. Or better yet they could put them in the Xamarin add-in repository!